Corrosion is relentless. Thanks to the second law of thermodynamics, things fall apart and the existence of oxygen in the air is enough cause for corrosion to set in. One of the biggest reasons for above-ground storage tank owners to get a handle on corrosion is that the weakened state of the tank builds uneven pressure, leading to a worst-case scenario — the BLEVE. Whether pronounced “blevie” or “believe,” BLEVE stands for boiling liquid expanding vapor explosion, and the name alone contains the first fallacy about what it is and how to prevent it. Anyone who has ever seen a BLEVE calls it an explosion for the massive fireball and destruction it causes. What is really going on here, though, is rapid expansion. This difference is critical because it leads to an understanding of the second fallacy. All that is necessary for a BLEVE is liquid or gas under high pressure, as this can turn into a vapor and cause a catastrophic rupture of the tank’s skin. 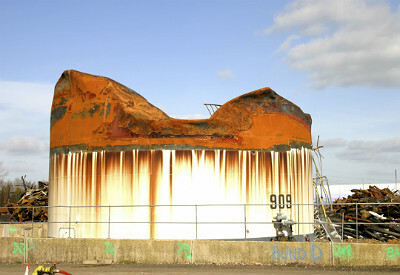 The trauma or pinhole collapse results from the vapors causing corrosive decomposition over time. Corrosion alone can introduce chemicals that result in rapid oxidation or polymerization. A thorough understanding of the difference between an explosion and a rapid expansion also explains the second fallacy. Water, liquid helium, liquid nitrogen and other common refrigerants can cause a BLEVE. The key words here are “boiling” and “liquid.” Many gases that are liquid at very low temperatures or under high pressure boil under normal atmospheric conditions. One oft-repeated case from Connecticut in 2006 involved a man at a party who threw a half-empty keg of beer on a fire. Beer is not flammable by any stretch of the imagination, but boiling beer became a vapor and overwhelmed the structural integrity of the keg, resulting in a BLEVE. The majority of incidents can be prevented by a pressure release valve (PRV). But even if the PRV is working properly and not blocked, it is designed to reset itself after releasing pressure. An intense source of heat can vaporize the liquid faster than the PRV can let it out. Removing the source of heat may not be enough, and actively cooling the tank is a recklessly dangerous operation. Heavier gas and liquid settle to the bottom of the tank, so the space at the top is where the BLEVE vapors originate. However, that doesn’t necessarily mean that the tank will rupture at the top. In Texas in 1988, railway workers suspected a car full of methacrylic acid — used for making plexiglass — of undergoing polymerization due to internally generated chemical heat. Quick thinking by the workers was able avert disaster. They surrounded the compromised tank with empty railcars before the BLEVE occurred, and luckily no one was hurt. New technology has made great strides in preventing the three majors causes of BLEVEs (fire, impact, corrosion), but the most effective tools will always be education and preparation.